Locate a soil testing lab near you. Note: If you want to track your soil’s progress, you should use the same lab year after year to compare your results. Request the S3M test ($16.50) and the Soluble Salts test ($3.50). Contact Waypoint Analytical to confirm prices. Ship the sample, form and testing payment ($20) to: Waypoint Analytical, 7621 Whitepine Rd, Richmond, VA 23237. Note: This payment is to the testing laboratory and does not include the cost of the Grow Your Soil recommendation. Ship the sample, form and testing payment to: A&L Western, 1311 Woodland Ave., Suite 1, Modesto, CA 95351. Note: This payment is to the testing laboratory and does not include the cost of the Grow Your Soil recommendation. Contact the appropriate laboratory to request the tests that would correspond to the S3M and Soluble Salts tests. Click here. For Mexico, these would be the ”Suelo-Fertilidad' and “Sales Solubles” tests. Payment is then made to the laboratory, which does not include the cost of the Grow Your Soil recommendation. Request 'Complete Soil Analysis' test (code CNSA022) – price (excl. VAT) KES 5,000 – contact CropNuts to confirm the price. Ship the sample, form and testing payment to: CropNuts, Mashiara Park, Kaptagat Road, Loresho, Nairobi, Kenya. Note: This payment is to the testing laboratory and does not include the cost of the Grow Your Soil recommendation. To send soil samples from outside of the US to Waypoint Analytical, click here. Once you have received your lab test results, send them to: info@growyoursoil.org to receive your organic fertilizer recommendation(s). Pay $25 per recommendation (one recommendation is provided for each test result) to Grow Your Soil. the best ways to apply these fertilizers and compost. If these fertilizers are not available to you, contact us and we will modify your report for fertilizers that are available to you. 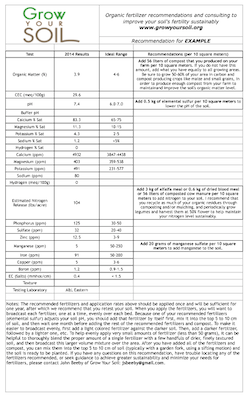 This is a SAMPLE report and should not be used directly to improve your soil. Your recommendation will be based on your soil test results and will be specific to your soil.